The drama Lucky features the late Harry Dean Stanton (Repo Man, Seven Psychopaths) in one of his only starring roles in a career that spanned over 200 films since the 1950s. Inspired by the life of Stanton himself, Lucky follows the spiritual journey of a 90-year-old atheist (Stanton, of course!) and the quirky characters that inhabit his off the map desert town. 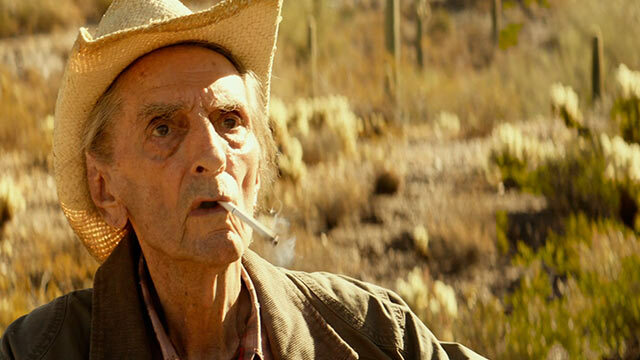 Having outlived and out smoked all of his contemporaries, the fiercely independent Lucky finds himself at the precipice of life, thrust into a journey of self-exploration, leading towards that which is so often unattainable: enlightenment. Acclaimed character actor John Carroll Lynch’s (Crazy, Stupid, Love) directorial debut, Lucky’s cast includes Ron Livingston (The Conjuring), Beth Grant (TV’s The Mindy Project), Ed Begley, Jr. (Cat People), Tom Skerritt (Fuzz) and the great filmmaker David Lynch (Blue Velvet). Bonus features on the DVD of the unrated film include interviews with the director, producers and writers, as well a few words from Stanton himself.